for their assistance and information. 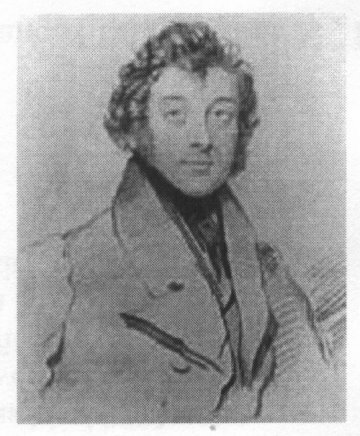 Sir Goldsworthy Gurney 1793 - 1875 a Cornishman who because his direct family line died out in the early 1900�s sadly became lost to time and was subsequently forgotten. His lifetime of achievements remained unknown and went unacknowledged throughout most of the 1900�s. Recently however, attention to his many achievements has been revived and written about, the latest being a biography by Dale H Porter published in 1998. Like many of his contempories of that period he was an Inventor, Engineer and Patentee. Goldsworthy Gurney was born in Treator Cornwall on the 14th February 1793. His unusual Christian name was taken from his godmother who was a maid of honour to Queen Charlotte. In Cambourne whilst on holiday he was most impressed and fortunate to see Richard Trevethick�s early experiments with steam engines mounted on wheels driving vehicles. Maybe this event excited his interest in engineering and which led to his later inventions. 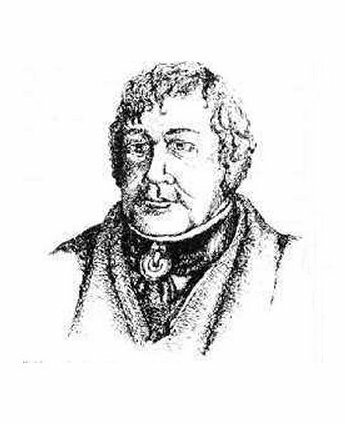 After his medical education and marriage, in 1814 he settled in Wadebridge Cornwall practicing as a surgeon, but also became interested in chemistry and mechanical science. He moved with his family to London in 1820 and there expanded his scientific knowledge and started giving a series of lectures on the elements of chemical science to the Surrey Institution. Gurney was one of the first, if not the first person to give serious thought to the construction of a vehicle propelled by steam to provide travel on the common roads. He soon started work on his steam carriage and in 1825 took out Patent 5170 to register his progress with the carriage project. In 1826 he moved to Albany Street and took over the premises 'The Regents Park Manufactory' of an American inventor and engineer called Jacob Perkins who was deeply involved with the construction of a 'steam gun'. The noise of which didn't sit well with the neighbours. In 1830 Gurney leased a plot of land in Bude from his friend Sir Thomas Ackland and set about the construction of a new house to be built amongst the sand hills. The original house called "The Castle" still stands but has been extended over the past century. The original part of the house is to the left of the turret. �oxy-hydrogen� blowpipe, where an intensely hot flame was created by burning a jet of oxygen and hydrogen together. the construction of a steam carriage for use on the common roads. the high-pressure �steam-jet� as applied to road or rail vehicles; which could also be used for the extinguishing of fires in coal mines; applied to blast furnaces for the making of iron; and for purging underground sewers. He improved the problematical lighting of theatres which used "limelight" with his "Bude Light". Using a standard flame producer such as an oil lamp and by adding oxygen directly into the flame he produced a dramatically increased bright white light. These type of lights were fitted in The House of Commons and also in Trafalgar Square where replicas of the two styles originally used can still be seen. They have recently been refurbished. 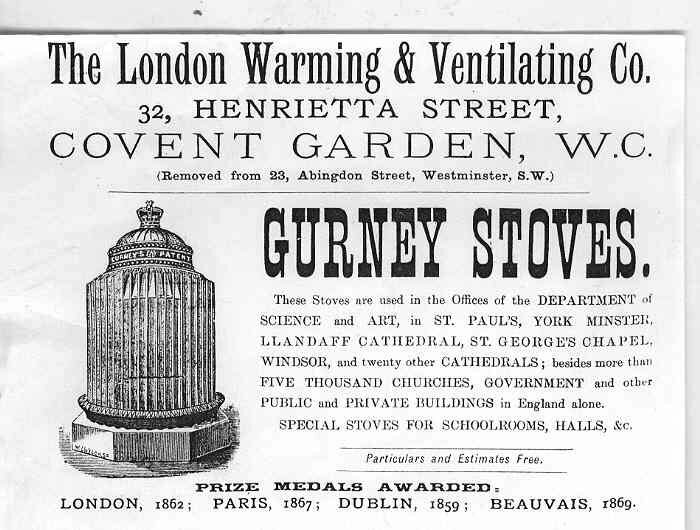 The �Gurney Stove� another invention which he patented in 1856 was extensively used to heat a wide variety of buildings. Many of these stoves are still in use to this day. 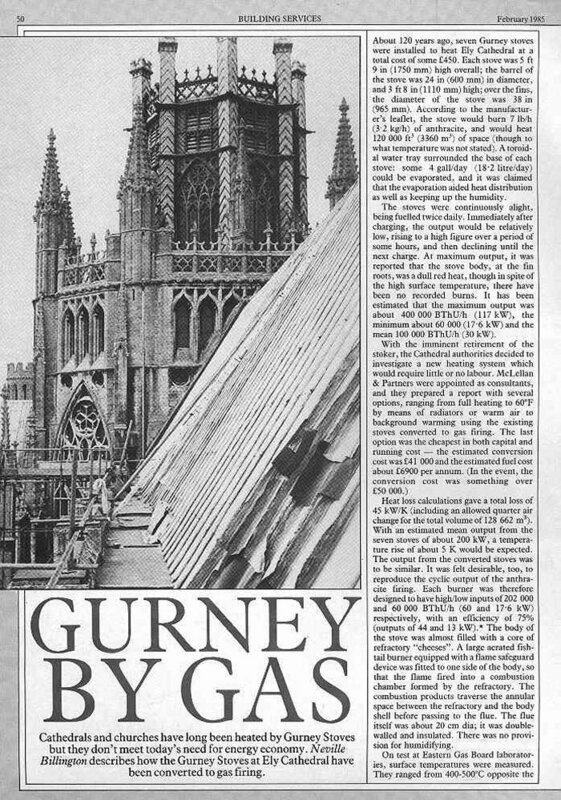 Gurney was associated over many years with the heating and ventilating of the Houses of Parliament. 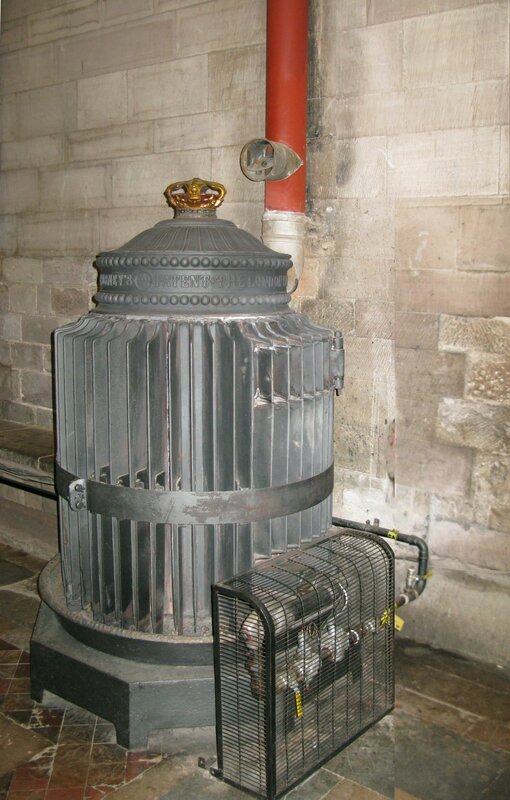 His stoves were used in the original heating and ventilating of both Houses of Parliament, and later in 1852 he introduced a new method of lighting and ventilating to the new Houses of Parliament. In July 1854 a paid appointment was made for him to become superintendant of the heating, lighting and ventilating which lasted from 1854 to 1863. He then retired from public life, and in August 1863 was knighted by Queen Victoria in recognition of his inventions and discoveries. Tragically later in that year he suffered a stroke which left him with partial paralysis, so he moved back to Cornwall living at Reeds near Bude. He died at Reeds on 28th February 1875. With acknowledgments to �The Dictionary of National Biography�. 5170 14th May 1825 Apparatus for propelling carriages on common roads or railways. 5270 21st October 1825 Apparatus for generating and raising steam. 5554 11th October 1827 Locomotive engines and the apparatus connected therewith. 6483 7th October 1833 Musical instruments. 8098 8th June 1839 Apparatus for producing and distributing light. 8902 25th March 1841 Production and diffusion of light. 9451 18th August 1842 Apparatus for producing, regulating and dispersing light and heat. "My improvements in Locomotive engines and the apparatus connected threwith, consist in a certain arrangement and modification of the various essential parts of locomotive high-pressure steam engines , whereby such parts are adapted to each other , and combined together in a suitable manner for coaches or travelling carriages, so as to impel the same forward upon common roads and highways without the aid of horses, and with a sufficient speed for the conveyance of passengers and goods. And whereas it is by virtue of particular combinations of all the essential parts of locomotive engines, and of certain apparatus connected therewith, and by the adaption thereof one to another, that I have been enabled ,after long study and repeated trials, at great expence, to produce a locomotive engine, applied in a stage coach, which is capable of advancing itself in an efficient manner along a common road when loaded with passengers; hence my chief claim to improvement consists in the totality of that particular combination of parts one with another which constituted the locomotive engine or steam coach which is herein after described. By such description competent mechanicians may construct and execute locomotive engines for steam coaches after that manner which I have found to perform properly for carrying passengers on common roads. The previous attempts by other persons to attain that object have proved unsuccessful for want of knowing how to combine the parts of locomotive engines with each other and with the apparatus of travelling coaches in a suitable manner for the purpose; but I have succeeded in finding out the particular means necessary to be used for attaining the desired result". He describes his Patent 5554 as a STEAM COACH or CARRIAGE adapted to convey Passengers and Baggage and to be propelled forward on Common Roads by the Power of the Locomotive Steam Engine contained within it (instead of horses). 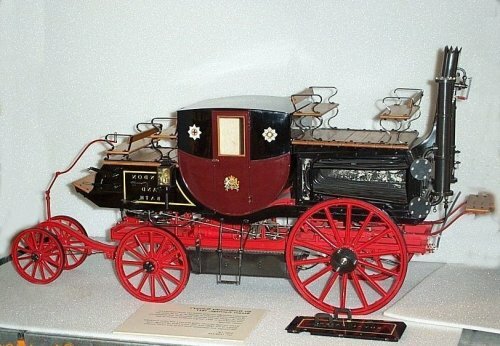 The external appearance of the steam coach resembles that of common stage coaches , but without the horses.It is mounted upon four principal wheels which sustain the principal weight ,and two small wheels called the pilot wheels are added to the fron end in place of the wheel horses. By these pilot wheels the coachman guided the coach in its progress along the road.the coach is advanced forward along the road by mechanical power exerted by high-pressure steam, which is generated in a boiler situated at the back part of the body of the coach..The steam acts against two moveable pistons contained within two steam cylinders which are fixed to the framework beneath the body of the coach, in a horizontal position, and these pistons act together (by the intervention of suitable connecting rods and cranks) to turn round the rear wheels in order to propel the coach forward along the road. 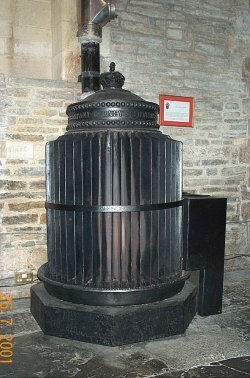 There is another smaller steam cylinder wherein the high-pressure steam also acts to impel a moveable piston, which by suitable intervening machinery is made to turn a revoving fanner with great velocity, in order to blow a continual current of air into the furnace within the boiler and thus maintain a strong fire therein without the necessity for a tall chimney. The piston of the small cylinder also works the feed pump by which the boiler is kept supplied with water so as to replentish the continual waste by evaporation into steam. It always helps to be able to read newspaper articles about the people whose history is being researched as it can authenticate items. One such small item about Gurney was written to The Times newspaper in 1931 by Barbara Carbonell of North Devon. She says in her letter to The Editor of the Times. "6th May 1829, ......... Jogged off with Leak for Mr Gurney's Manufactory. found him at home. chatted for a few minutes and then surveyed his workshops and the steam carriage, the old heavy one, and a new light one to be finished by next week "
"7th May ........ Sallied forth with Mr Gurney and his daughter, who called to invite us to dinner ....... Spent the evening with him "
" 9th May ....... Dined with Mr and Mrs Gurney , looked again at the workshops and new steam coach, which ran around the yard yesterday, and which the lateness of the meeting I attended prevented me from seeing . sallied forth with them to the Zoological Gardens .......... returned with gurney and went on board a steam boat, which was trying the effect and power of one of his engines. cruised up and down the canal - the agitation of the water after the boat was incredibly fine ....... "
"Monday 18th May, Dined after which went to friend Gurney's and saw the steam drag go round with a cart attached to it, in which I rode with many others, a neat ingenious machinery ........... "
It appears that Gurney's improvements to the ventilation of the House of Commons could have ended in disaster during 1858 the summer of the 'Great Stink'. September 1852. Dr David Boswell Reid was sacked as Ventilator to the House of Commons. It was time to invite Goldsworthy Gurney a Cornish inventor and one of Reids rivals to have a go. This Gurney did with much gusto that he very nearly took the place of poor mad, deluded, tortured Guy Fawkes as the man who came nearest to blowing up Parliament. Gurney apparently had a predilection for gunpowder; he set off 60 pounds of it in the House of Lords to test their air supply � �by flashing small portions in rapid succession . . . I watched the first appearance of the smoke in various parts, its apparent quantity, and noted the time it took in coming and going out. Naturally, Gurney turned the whole system round and instead of drawing air in through the Clock Tower and the Victoria Tower, he drew it in from ground level, and expelled it through the towers. Both Towers had large furnaces at the bottom to provide the up-draught, and small turrets that had three fish tails gas jets burning inside to help the upward flow of air. The scheme did not do much good; the commons was still uncomfortable � Sir Henry Verney kept a pair of worsted stockings and gaiters in the House to try and keep his feet warm � and, above all, the Thames still stank. One earnest seeker after pure air suggested that fountains of fresh water should play in all the corridors and rooms of the Palace, on the peculiar assumption that the water would absorb the smells. Not surprisingly no one took up the idea. Gurney suggested dredging deep channels parallel to both shores of the Thames into which the sewage was supposed to drift, but MP�s doubted if it would work, and insisted that the old remedy should be continued � pouring ton after ton of lime into the water to try and purify it. Gurney busied himself being scientific; he hung pieces of paper soaked in acetate of lead in the Chambers of the Lords and Commons, in their Libraries in the corridors and on the Terrace. They proved that there was sulphurated hydrogen in the air, which probably impressed the committee no end as they sat in their room behind curtains soaked in disinfectant. Yet somehow the smell had to be kept in check. Goldsworthy Gurney had an idea. Gurney believed that vitiated air could be burnt off in flares, rather on the lines of a North Sea gas flare. He wanted to close off all the open sewers in London, and erect a series of flares to get rid of the gases. So why not have one on the top of the Clock tower at Westminster? MP�s were willing to give anything a try at this stage and gurney went ahead. 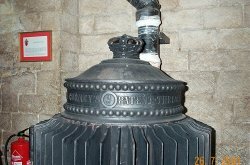 He arranged for the main Victoria sewer to be connected to the flues in the Clock Tower which carried the vitiated air from the Palace, on the theory that the gases could then be flared off from high above the building. Unfortunately the flares would not light. Next, Gurney put a coal fire at the base of the Clock Tower and tried again; this time the gases burned. One day though when Mr Joseph Bazalgette, the chief engineer at the Metropolitan Board of Works, was examining the pipe that led from the main sewer to the Clock Tower, he discovered that there was a leak from a fractured coal-gas pipe into the sewer, and only a trap-door in the sewer was stopping the coal-gas from reaching the furnace at the bottom of the Clock Tower. There had already been one small explosion, although no one was hurt and no damage done. If the full blast of coal-gas and sewer gas had reached the furnace, then the chances are that the Clock Tower would have taken off for the moon, and the rest of the Palace would have been destroyed with it. Gurney, who so nearly blew up the Palace of Westminster, died knighted and respected in his bed. Guy Fawkes, a bumbling plotter of ludicrous incompetence, died in excruciating agony on the scaffold not far away, in Old Palace Yard. The furnace that Goldsworthy Gurney built remained there for many years, and the Clock Tower itself retained its function as the worlds most famous, if most unknown chimney. Gurney had always shown an interest in the warming and ventilating of buildings. In 1822 he mentioned in a lecture, that he had in collaboration with others, considered using steam heating systems for various types of buildings including houses. The heating system involved long distribution pipework connected from an external steam boiler which then fed simple terminal heaters in the various rooms. He applied his knowledge on methods of heat transfer to his new heating system for the House of Commons. His arrangement for attaching purpose made fins to heating pipes is reputed to be the first time that serious consideration had been given to deliberately increasing the surface area of pipework to improve the heating output. It may well have been the forerunner of the air heater battery as we know it today. For some reason Gurney chose not to patent this idea, but he used the principle and applied extended surface area fins to his cylindrical warm air heating stove. He was granted a Patent for his warm air stove. Was he the first person to consider heat recovery from lighting fittings? In his Patent 9451 applied for in 1842 it says "this heated vapour or steam may by the means of the pipe be conveyed to heat baths or rooms" This has to be the first time that heat recovery from a lighting fitting was proposed in writing. Goldsworthy Gurney invented a new type of warm air stove which he patented in 1856 as British Patent 1468 dated 23rd June. 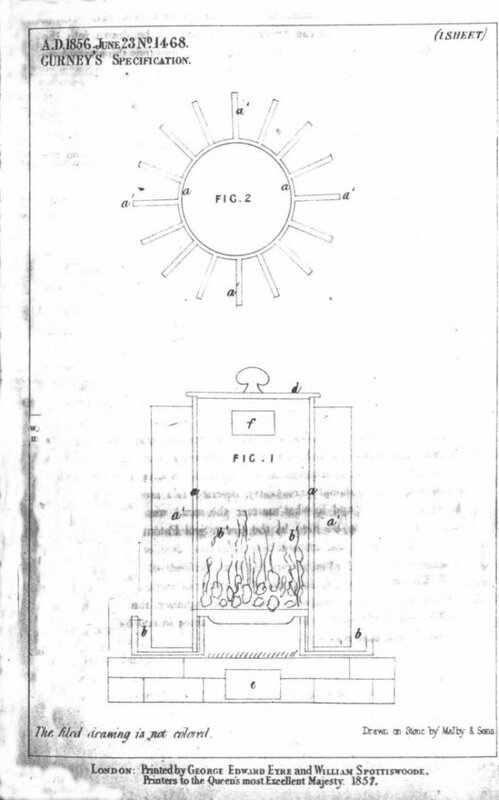 The patent was titled "Certain Improvements in Warming and Moistening Air" It was described as an apparatus constructed to apply the laws of conduction and convection of heat for the purposes of warming and moistening air. 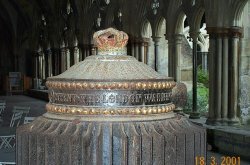 The apparatus was a metallic vessel having a number of plates extending from its outer surface, standing with the plates vertical in a shallow trough of water. 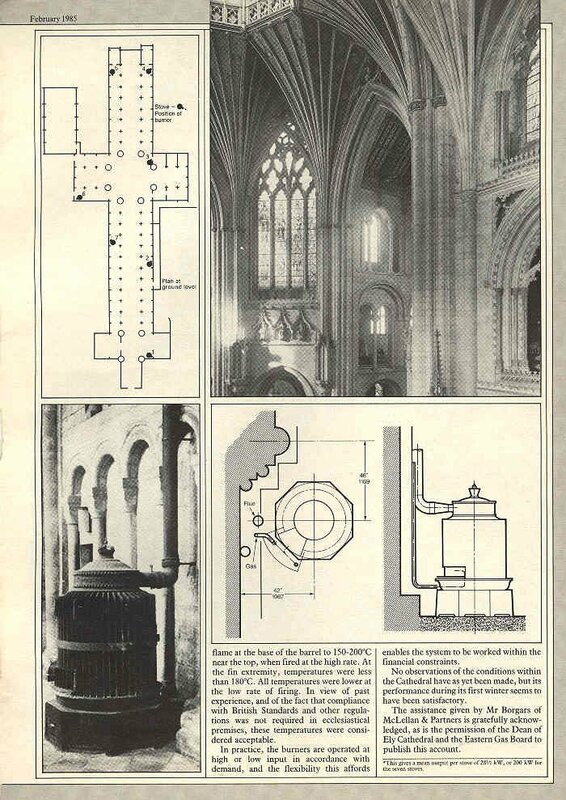 The following list is of Cathedral Churches and Abbeys originally heated by Gurney stoves. 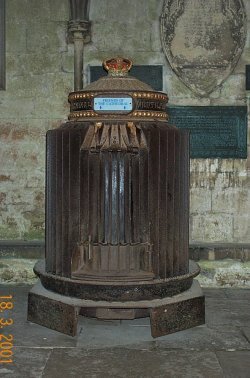 It has recently been discovered that there are other Gurney stoves which still exist in Churches in various parts of the country. The heritage group is always keen to hear about these links with our engineering past, and will add them to the Gurney webpages. His eldest daughter Anna Jane Gurney was his constant companion throughout her life, and took the deepest interest in all his discoveries. This fact is made very evident by the emotive letter she wrote after the death of her father to the Editor of The Times newspaper in December 1875, titled "THE STEAM BLAST". The letter vigorously defended her father's invention of the "steam blast". Sir, After the railway jubilee held at Darlington, published accounts gave the credit of the invention of the steam blast to Mr G. Stephenson, probably from the mistaken impression of Mr Smiles, the entertaining writer of "The Life of George Stephenson" and subsequently a letter appeared in more than one newspaper, signed "T Hackworth" claiming for an engineer of that name - the manager of the Stockton and Darlington Railway - the invention of the steam-blast pipe in 1827 and the first application of it to the "Royal George" in the same year. 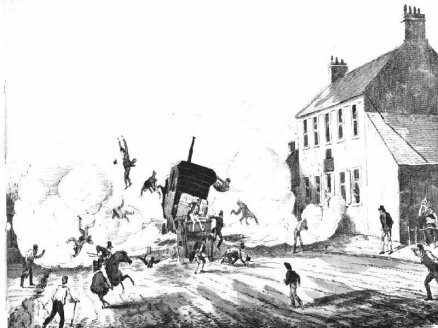 By this is evidently meant the "steam-jet" or "blast" which was applied by the late George Stephenson to his railway-engine "the Rocket" and which gave it suddenly that rapid speed - 30 to 60 miles an hour - which astonished everyone and gained for him the prize of �500 offered by the directors of the Liverpool and Manchester Railway for the best locomotive engine which could be produced by the first week in October 1829. Before that date no railway locomotive had exceeded the rate of eight or ten miles an hour. "On the day previous to the famous Rainhill trial the engines were privately tested. Stephenson's Rocket could not generate her steam sufficiently fast, while Hackworth's "Sanspareil" was always full of steam. "How is't said Stephenson that your engine keeps up her steam? "Oh" replied Hackworth "I have a little chap inside who manages that" - alluding to the blast pipe. That night Stephenson sent men to ascertain the make and shape of the wonderful invention, and next morning "the Rocket " was found fitted with a blast pipe." It is I believe true that Mr Timothy Hackworth conveyed the plan of the "steam-blast" from my father (the late Sir Goldsworthy Gurney) to the north of england in time for that celebrated trial of railway locomotives which was held at Rainhill on the Liverpool and Manchester Railway, at the time appointed. But I most distinctly claim for my father the merit of that invention. He himself claimed the "steam-jet" or "blast" as his invention, and in a pamplet printed in 1859 giving his account of it says he used it in the decomposing furnaces while giving a course of lectures on chemistry and natural philosophy at the Surrey Institution, London in 1822. I remember as a child being present at one of those lectures and seeing the limelight produced by his oxy-hydrogen blow-pipe, when the whole theatre of the institution became as bright as bright sunshine and the shadows on the wall startled me. Perhaps the showers of brilliant sparks from a file, put in place of the lime, pleased my young eyes better. The "steam-jet" or "blast" I did not see or understand then; but I saw its wonderful effects two or three years after, and four or five years before 1829. Our house was in Argyle Street, Regent Street where my father was in practice as a medical man,at the same time making experiments of all works; and his steam-carriage was begun at that house, but a manufactory was soon taken and he found it necessary to be there and to have his family with him. We occupied rooms which were probably intended for Sir William Adams, a celebrated oculist for whom this building was erected as an eye infirmary in Albany Street Regents Park. From a window of my room I looked into the yard where my father was constructing his steam-carriage. The intense combustion caused by the steam blast, and the consequent increase of high-pressure steam force acting on the jet, created such a tremendous current or draught of air up the chimney that it was something terrific to see or hear. The workmen would sometimes throw things into the fire as the carriage passed around the yard - large pieces of slate or sheet iron - which would dart up the chimney like a shot, falling occasionally nearer to the men than were safe, and my father would have to check their enthusiasm. The roaring sound, too, sometimes was outstanding. Many difficulties had to be overcome which occupied years before 1827. The noise had to be got rid of, or it would have frightened horses, and the heat had to be insulated, or it might have burnt up the whole vehicle. The steam machinery was at first contrived to be in the passenger-carriage itself, as the turpike tolls would have been double for two vehicles. My father was forcibly reminded of this fact, for there was then a turnpike-gate immediately outside the manufactory. This gate was first on the south side of the doors, and the steam-carriage was often exercised in the Regents Park barrack yard; then the gate was moved just a few yards to the north, between the doors and the barracks. But perhaps the greatest difficulty - next to that of prejudice, which was strong against all machinery in those days - was to control the immense power of the steam to guide the carriage. It would go round the factory yard more like a thing flying than running, and my father was often in imminent peril while making his experiments. He however at last brought the carriage completely under control, and it was perfected. One was built to carry the machinery, the driver, and stoker only, and to draw another carriage after it. My father could guide it, turn it, or back it easily; he could set it going or stop instantly, up hill or down; it frequently went to Hampstead, Highgate, Edgware, Barnet, Stanmore, and its rate could be maintained at 20 miles an hour, though this speed could only be indulged in where the road was straight and wide and the way clearly to be seen. I never heard of any accident or injury to anyone with it, except in the fray at Melksham, on the noted journey to Bath, when the fair people set upon it, burnt their fingers, threw stones, and wounded poor Martyn the stoker. The steam-carriage returned from Bath to Hounslow Barracks - 84 miles - stoppages for fire and water included, in nine hours and 20 minutes, or at the rate when running, of 14 miles an hour. This journey from London to Bath the first ever maintained with speed by any steam locomotive, was made in July, 1829 on the common turnpike road, in the face of the public, and two months before the trial at Rainhill. The "steam-jet" or "blast" to which the continued and rapid speed of the locomotive was due, was no more the invention of Mr Timothy Hackworth than of Mr George Stephenson. It was thought of , experimented with, and applied to locomotion by my father years before the Rainhill trial or 1827. He understood it well, and applied it also for various purposes - for the ventilation of collieries, for the ventilation of the Houses of Parliament, for the extraction of poisonous vapours from sewers, and for the extinction of coal mine fires. It is used with great success for the consumption of poisonous vapours arising from alkali works, and for obtaining excessive heat or draught of air in the arts and manufactures; it is employed in the blast furnaces and iron foundries, in the making of iron rails, and the locomotive itself, as well as for giving it its rapid speed. "The steam-blast" being a high pressure force, would also draw air through mines and render them independent of atmospheric pressure, to which the late fearful explosions are evidently due. The "little chap" as Mr Hackworth facetiously called the "blast pipe" is, however, not of itself all that is necessary to form the "steam blast". The chimney is required to be of a certain proportionate size, shape and height, and the jet must be properly placed in that chimney and, above all things, the steam must be maintained at high-pressure force in escaping from the jet. When all my father's exertions were ended and his steam carriages were established by Colonel Sir Charles Dance, on the Cheltenham and Gloucester road, over which they ran carrying passengers four times a day, for months, without accident of any kind, Parliament crushed his common road project by laying on heavy turnpike tolls, and the advantage of all his years of toil was at once transferred to the railways. Well for the people it was so. But is the inventor of the "steam blast" to be robbed or be forgotten? A Railway Jubilee has been held at Darlington. Surely a jubilee would, with far greater reason, be held in 1879 to commemorate the rapid speed of the railway locomotive attained by means of the steam blast in October 1829. Such a jubilee might well be held, not only at Darlington but at Rainhill, Manchester, Liverpool, and throughout the whole land. To commemorate the memory of her father Miss Anna Jane Gurney had a painted stained-glass window placed on the north side of St Margaret's Westminster. The window was unveiled on Thursday 29th July 1892 by the Duke of Wellington. Among those present at the ceremony were the Speaker of the House of Commons Archdeacon Farrar, General Gurney MP, the Rev F T Batchelor and the Rev H P Gurney. The window had in the upper part the central figure of the Lord as the Light of the World with Angels on either side. The under part represented some of the works of Sir Goldsworthy Gurney's life - notably the discovery of the limelight, startings of the magnetic needle, and the first successful passenger locomotive. He will be remembered as the well known figure supervising his system of lighting and ventilation in the Houses of Lords and Commons. Miss Anna Jane Gurney was unable to attend the window unveiling ceremony due to her age and she died three years later on the 19th May 1895 at her home Reeds, near Bude Cornwall. Tragically this window was damaged and destroyed by enemy action in World War II. What makes it extremely sad is it is one of the couple of windows, the only ones that were destroyed in the air raid.